In an earlier article we talked about different methods for traditional composting yard and kitchen waste . Today, we’re going to cover Vermicomposting- composting with worms! Composting, the process of taking raw organic material like kitchen scraps, lawn trimmings, dead leaves, and chipped woody material and turning it into a useable, stable, non-offensive soil amendment can be done in any living situation. By composting our green waste and kitchen scraps, we reduce our impact on landfills and enrich the soil in our yard and gardens. For this discussion, we’ll be using the word “organic” to mean anything that is alive or was once alive like plants and animals or any waste produced by plants and animals. Organic material accounts for as much as 52% of the garbage humans create. That’s a huge amount of material ending up in our landfills that could be utilized in our yards, gardens, and even our planter boxes. 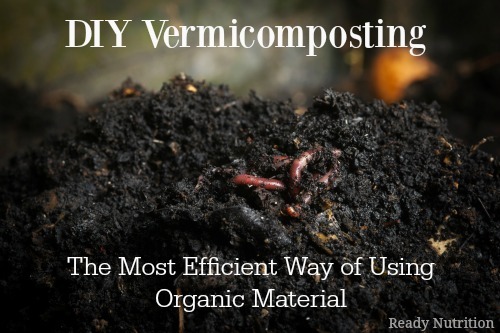 Many urban gardeners use vermicomposters as a way to get started with raising worms. You can buy a worm bin like the Worm Factory  or simply build your own. Arguably the easiest way to build your own is to purchase a plastic storage bin with a lid. The size of the tub will depend on the amount of food scraps you think you’ll generate in a day. Generally, worms can eat about 75% of their body weight in food scraps in a day, and the bin should have one square foot of bin surface area for every half-pound of food scraps. Use the formula of width in inches divided by 12 times length in inches divided by 12 (or W/12xL/12). A tub similar to this one  would work well. Avoid clear or see-through tubs. Worms don’t have eyes, but they do have light sensors on the surface of their skin. Light causes them pain and they’ll run away from it. It’s better to use a bin that is opaque.